Silicon Valley is considered by many to be the technology capital of the world and what happens here has a profound influence on the entire world. As San Jose State University continues to prepare students to join the 21st-century workforce, the College of Applied Sciences and Arts (CASA) encourages many of its undergraduates to take at least one academic course abroad, taught by an SJSU faculty member, before they earn their degree. Unbounded Learning, one of the major goals established by the Vision 2017 initiative, asked faculty and students to think outside the classrooms. CASA’s International Experience Initiative began in fall 2015 and now requires students enrolled in majors in five schools or departments within the college – School of Journalism and Mass Communications and the departments of Occupational Therapy, Hospitality Management, Kinesiology, and Justice Studies – to complete the requirement. About 175 students are anticipated to participate in eleven faculty-led programs with CASA faculty in 2017 (additional faculty-led programs are offered by faculty in other colleges as well). “The goal of CASA’s international experience requirement is to introduce students to international and intercultural perspectives as a way to prepare them to live and work in an increasingly globalized world,” said Pamela Richardson, an associate dean in CASA who oversees the International Experience Initiative. Accompanied by SJSU faculty members on their international excursions, which usually last about three weeks, the destinations and cultures have been as diverse as the subjects studied. Shirley Reekie, a professor in the Department of Kinesiology, is scheduled to lead her course in Sports, Culture and Recreation to the United Kingdom again this summer, while Deepa Singamsetti, lecturer in the Department of Nutrition, Food Science and Packaging, will return to Puerto Rico to lead courses in food, culture and the environment. She plans to do it again – in India – next winter. This summer Lynne Andonian, an associate professor of occupational therapy, and Ruth Rosenblum, an assistant professor of nursing, will repeat their 2016 course offering on interdisciplinary health care, again in Finland. Diane Guerrazzi, an associate professor, and Halima Kazem, a lecturer, in the School of Mass Communications taught a class in Greece and Germany last summer that documented the path of refugees from Syria and other countries into Europe. They plan to take another class of 14 pupils to Greece and Italy this summer, again to cover the migration of refugees from Syria as well as other Middle East and African countries. During their upcoming three-week trip, the students will learn how to write and produce documentary broadcast reports while visiting refugee camps, relief agencies and a small town in Italy that has taken in an extraordinary number of refugees. Both Guerrazzi (broadcast) and Kazem (print) have extensive international reporting experience. Jayne Balthazar, an SJSU alumna, traveled to Paris in summer 2014 with Linda Levine, a lecturer in the Department of Health Science and Recreation. “It was the first time I earned a scholarship and traveled independently (of my family) and shared a room with someone I barely knew,” Balthazar said, noting that she also raised money on her own to take the trip. She said Levine and her husband David Buseck, an SJSU lecturer and co-instructor of the program, helped the students navigate the city and learn many things. Students who seek an alternative from the study abroad requirement – due to financial hardship, serious personal life situation, or physical limitations – may petition CASA to substitute a one-unit online seminar in conjunction with 20 hours of volunteer service to a San Jose organization that helps individuals or groups and represents a cultural heritage other than their own. Further information about the program is available online. Undergraduate and graduate research students have the opportunity to present their work and compete for selection as SJSU representatives at the annual CSU Student Research Competition at California Polytechnic State University, San Luis Obispo. Applications are made to the appropriate college and each college submits their selections to the Office of Research. Details about the competition follow and can also be found at the following link: http://www.sjsu.edu/research/student-research-competition/. A PDF copy of this announcement with instructions can be found at: General Description and Information for 2017 Competition. Each college established its own deadline for receipt of the nominations from its faculty, included below. College of Applied Sciences and Arts (CASA) – Application packets should be submitted to the CASA Dean’s Office, MH 431, by 5 p.m., on Monday, Feb. 6, 2017. Lucas College and Graduate School of Business – Application packets should be submitted to the Business Dean’s Office, BT 950, by 4 p.m., on Monday, Feb. 6, 2017. Connie L. Lurie College of Education – Application packets should be submitted to the Education Dean’s Office, SH 103, by 5 p.m., on Friday, Feb. 10, 2017. Charles W. Davidson College of Engineering – Application packets should be submitted to the Engineering Dean’s Office in care of Teresa Mercure, ENG 493, by 4 p.m., on Monday, Feb. 6, 2017. College of Humanities and the Arts – Application packets should be submitted to the Humanities and the Arts Dean’s Office, WSQ 120, by 5 p.m., on Monday, Feb. 13, 2017. College of Science – Application packets should be submitted to the Science Dean’s Office, SCI 127, by 4 p.m., on Monday, Feb. 6, 2017. College of Social Sciences – Application packets should be submitted to the Social Sciences Dean’s Office, WSQ 103, by 5 p.m., on Friday, Feb. 10, 2017. Feb. 20, 2017 – Colleges send electronic copy of completed student delegate registration form and 5-page summary for each student to gilles.muller@sjsu.edu or deliver a hard copy to the Office of Research (ADM 223B). Student teams must submit individual registration forms for each one of its members. March 1 and 2, 2017 – Student presentation of research and subsequent selection of SJSU finalists. March 17, 2017 – SJSU Office of Research submits SJSU finalist list to California Polytechnic State University, San Luis Obispo. April 28 and April 29, 2017 – CSU Student Research Competition at California Polytechnic State University, San Luis Obispo. – The summary must include the names(s) of the student(s) and the title of the presentation. – The narrative may not exceed five double-spaced pages. Use fonts and margins that ensure legibility. – Appendices (bibliography, graphs, photographs, or other supplementary materials) may not exceed three pages. – Research that has human or animal subjects involvement must have appropriate institutional review. Each college may send forward a total of FOUR student projects (undergraduate and/or graduate) representing outstanding research or creative activity. Students eligible to compete at SJSU and at the CSU-wide competition at California Polytechnic State University, San Luis Obispo, are undergraduate and graduate students currently enrolled or those who graduated in May 2016, August 2016 or December 2016. The research presented should be appropriate to the student’s discipline and career goals. Proprietary research is excluded. *Creative projects are welcome, see SJSU Oral Presentation section for more information. Student research will be presented on March 1 and 2, 2017, from 1:30 to 6 p.m. (or as the number of eligible participants dictate) in IRC 101. This event is not open to the public. See the Open House Celebration section for the event open to the campus constituency. Students in Group B will make their presentations on March 1; those in Group A will present on March 2. Each student or multi-student group will have 10 minutes to present her or his research orally and five minutes to listen and respond to juror and audience questions. Students are encouraged to use delivery techniques that promote interaction with the audience. All entrants may use audio visual materials as appropriate. An entrant in the Creative Arts and Design category may present an audio and/or visual record of a performance s/he has given or a work s/he created; the oral presentation should focus on the rationale and historical context underlying the student’s interpretation of the material. Successful students in previous years often have been those who practiced with their advisors or other faculty and students. It is expected that students will not make oral presentations by simply reading directly from their research summaries. – Presenter’s ability to handle questions from the jury and general audience. After the event, Associate Dean Gilles Muller in the Office of Research can provide feedback to each student (or each group) on her/his presentation if requested. The 38th SJSU Annual University Research Forum sponsored by the SJSU Research Foundation and the Office of Research will be held on Wednesday, April 5, 2017, in Engineering 285/287. Refreshments will be served. The Forum will be a celebration for students who have been selected to represent San José State University at the 31st Annual CSU Student Research Competition. At this event, SJSU finalists will receive a small monetary award that can be used to defray students’ basic travel expenses to the CSU statewide competition. Finalists in a multi-student research group have the one monetary award amount split equally between all group members. The Forum will also recognize the faculty mentors of selected students by the presentation of Distinguished Faculty Mentor awards. At the Forum, finalists will be available to discuss their research at a poster session; family and friends are invited to attend. The 31st Annual CSU Student Research Competition will be held April 28 and 29, 2017, at California Polytechnic State University, San Luis Obispo. The competition is held to promote excellence in undergraduate and graduate scholarly research and creative activity by recognizing outstanding student accomplishments throughout the twenty-three campuses of the California State University. Evaluation criteria to be used is the same as the evaluation criteria shown above except the jurors will be comprised of experts from corporations, foundations, public agencies, and colleges and universities in California. There will be separate undergraduate and graduate divisions for each category (listed in Divisions of Competition section) unless a division has four or fewer entrants, in which case undergraduate and graduate divisions may be combined. The California Polytechnic State University, San Luis Obispo, steering committee reserves the right to combine or subdivide the categories or to move an entrant from one category to another, as numbers of submissions necessitate. Based on the recommendations of the jurors, cash awards will be provided to the outstanding presenter and the runner-up in both the undergraduate and graduate divisions of each category. If the undergraduate and graduate divisions of a category have been combined because there are fewer than four presenters in one division, awards will be provided to the outstanding presenter and the runner-up without regard to class standing. In the event there are five or fewer presenters in a session, only the outstanding presenter will receive an award. If you have questions about the SJSU Student Research Competition, please contact the Office of Research in care of Gilles Muller at 408-924-2632 or gilles.muller@sjsu.edu. For any matters related to the Forum, please contact the SJSU Research Foundation in care of Brenda Swann at 408-924-1414 or brenda.swann@sjsu.edu. 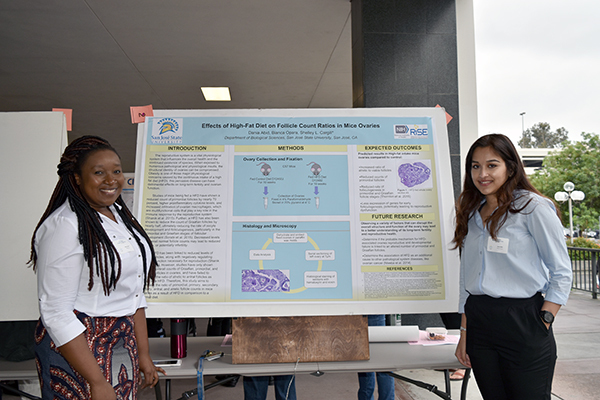 Biological sciences majors Bianca Opara, left, and Dania Abid share their findings at the College of Science Student Research Day. The College of Science released the 2016 edition of its “The Scientist – Science in Our World and Beyond” newsletter. The newsletter includes articles on student, faculty and staff activities in each of its departments as well as news about research grants, faculty awards and progress on a new interdisciplinary science building. Bernd Becker, left, and Diana Wu, have been recognized for prolific research, with the most publications in their areas of expertise in the nation for the last five years. 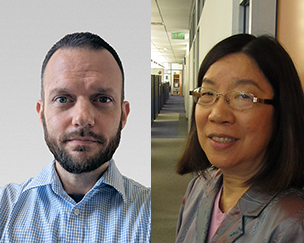 Bernd Becker and Diana Wu, along with other faculty members who work at SJSU’s University Library are more than just librarians. They are prolific researchers who study how students use libraries in hopes of improving student success and information literacy. San Jose State University’s Dr. Martin Luther King Jr. Library has been recognized as having the most prolific university library researchers in the nation based on number of articles published in subject specialty journals in the last five years (2011-2015), with Becker recognized for the most publications in the category of behavioral/social sciences and Wu recognized for the most publications in the category of information literacy and business resources. SJSU was ranked third overall out of 278 four-year institutions of higher learning for all categories. The rankings were announced at the Special Libraries Annual Conference in Philadelphia on June 13. SJSU was cited as “best in the nation” in behavioral/social sciences for Becker’s work and business for Wu’s contributions, accounting for 26 percent and 28 percent of the national share of papers. SJSU librarians, who are classified as faculty members, published 36 articles in subject specialty journals in the last five years, outpacing their publication record for the previous 10-year analysis period (2000-2010). Valeria Molteni, the interim associate dean for Research and Scholarship, said the active research by SJSU librarians ranges from research to improve how students use library resources in specific disciplines to collection development to how to best incorporate technology to how to help people develop skills to get the information they need in the moment. “We are also doing research about space and how students experience it so we can improve services,” Molteni noted, adding that digital screens were added to 22 study rooms because through research librarians discovered that students wanted a way to practice presentations. Emily Chan, the academic liaison librarian and scholarly communications coordinator, agreed that much of the research is focused on making libraries a third place where students spend their time outside of their homes or work places. “The library is not only a place to study, but to eat, to socialize and to play,” Chan said. Becker’s research is focused on developing best practices and principles for implementing high-tech, efficient library services for students and the university. During a sabbatical this fall, Becker plans to refine a longitudinal assessment tool of information literacy skills that he developed with fellow SJSU psychology professor Clifton Oyamot. “My hope is to make this tool scalable so that any SJSU department interested in assessing information literacy can easily adopt it into the curriculum,” he said. Diana Wu, who has worked with the University Library for nearly 30 years, said she is interested in how users receive and use information to fulfill their daily needs. “For our students, I am especially concerned with how they educate themselves to become productive citizens,” she said. Since she started with the University Library, she has been focused on information literacy and has coauthored multiple papers with other SJSU colleagues including Malu Roldan, Sue Kendall, Marilyn Easter, Bobbi Makani, Ann Agee and Connie Haley, from Chicago State University. Her articles, available on SJSU’s Scholarworks, have been downloaded 2,385 times by scholars at 111 institutions in 64 countries. Wu and Becker’s research is ultimately focused on supporting student success. Becker said he appreciates his library colleagues and administration’s focus on placing student success above everything else. Wu said she helped to develop a campus-wide survey to collect data assessing information literacy proficiency, which has been helpful since information literacy has become one of the core proficiencies for graduation that is assessed by Western Association of Schools and Colleges (WASC) for accreditation. In the coming year, she plans to work with junior colleagues on investigating student’s information seeking behavior in an era where most students rely on mobile devices to access information. Wu said she has appreciated the encouragement through the years from administrators, including former Provost Carmen Sigler and former library Dean Patricia Senn Breivik, both of whom supported her as she completed “Information Literacy at the Workplace: a Cross-Cultural Perspective” with a grant from the Business Reference and Services Section of the American Library Association.